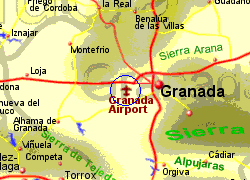 Granada airport is located approximately 15Km west of the city of Granada, adjacent to the A92 Granada to Antequera motorway. A bus service runs between the airport and Granada city every hour during the day at a cost of 3 Euros. A bus service also runs from the airport to Jaen city twice a day, costing 9 Euros for the 2 hr journey. 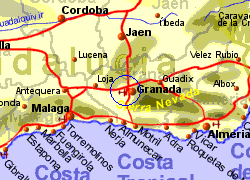 A taxi to Granada city will cost approximately 25 Euros, 30 Euros to the Alhambra, or 80 Euros to the Sierra Nevada.